Today's tip is about clothes shopping. I know, I know, it's No Spend Month and I'm talking about shopping. Go figure (: Goodwill has become one of my favorite places. Not only are there great finds at great prices, but the money spent there is going to a good cause and helping the community. Oh! 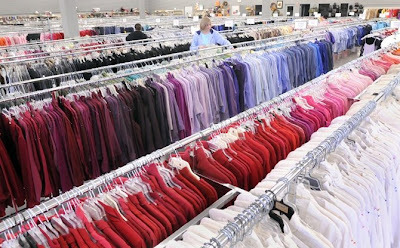 Don't you just love the way they organize the racks by colors!! Why would you pay full price for a perfectly good designer suit when the same suit could be purchased at Goodwill for under $15? Much of the clothing donated to Goodwill has never been worn and many times the tags are still on the garments. My mother lost a lot of weight and purchased quite a few new pieces from her favorite clothing store only to loose more weight. The new pants and shirts she just purchased no longer fit. Mom didn't want to spend even more money after the first investment, so off to Goodwill she went! She was able to purchase 1 fitted blazer, 3 pairs of dress pants, 1 pair of jeans, 2 cardigan sets, 4 sweaters and 4 blouses for under $70 and almost all of the items were designer names. She would have easily spent over $500 for the exact same items had she gotten them from the original stores. Many places have one day set aside for replenishing merchandise. Ask the store manager when they get in new items and visit on those days to get first pick. Set a budget, look for basic key pieces and build a wardrobe that suits your lifestyle. Once you have a good foundation of basics, then add trendy, fashionable items that can be switched out as the styles change and don't forget to spend some of that money you've just saved on great shoes that will last.